The DelayLab comes packed with vintage and modern effects. NAMM 2012 PRESS RELEASE: Delay effects are a must for satisfying the individualistic creativity of any guitarist. Their long history encompasses both the analogue and digital eras. Many classic delay pedals have played a prominent role through the years, contributing to numerous memorable phrases, generating dreamlike spaces and producing psychedelic performances, both on stage and in the studio. 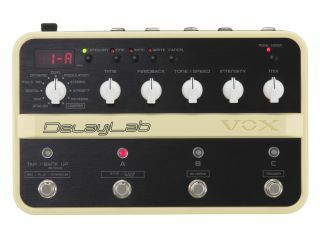 These sought-after units - as well as new delays destined to become standards for the coming generation - are all included in the Vox DelayLab. In addition to 30 diverse delay effects, the DelayLab offers a stereo looper that can capture up to 28 seconds, 30 stage-ready programs, and a wealth of extras, all packed into a sturdy diecast body. With an expressly vintage vibe, the easy-to-use front panel offers satisfying hands-on control over a diverse array of sounds and features. In short, the DelayLab delivers virtually infinite potential, befitting its status as the new standard for effect processors. Over the years, numerous delay effects have come along, such as tape echoes, analogue and digital delays. Each has varied by type, manufacturer, and internal structure. From the distinctive distortion and warmth of tape, the unique tonal change produced by an analog BBD (Bucket Brigade Device) circuit, to the lo-fi sound typical of low-resolution digital circuitry, the DelayLab delivers perfect models for a carefully selected set of historically significant delay units that have fascinated guitarists through the years. There are also numerous special types of effects such as pitch change, panning, and reverse. Parameters not found on the original models are also provided, offering unique expressive possibilities that go beyond simply modelling the classic units of the past. The DelayLab also contains numerous practical and original delay effects that will inspire any guitarist. Dual Delay makes effective use of two delays; Distortion Delay adds distortion to only the delayed sound; Reverse Delay can adjust the mix ratio between forward and reverse sound; Space Delay applies a string-like tonal effect to deepen the sound. An incredible array of possibilities is available: any of these effects are capable of creating aggressive and radical sounds as well as being used to add a subtle sense of depth. The DelayLab provides extensive looper capabilities that can be combined with the delay effects to surpass the abilities of the numerous dedicated units that have been in the spotlight of guitar performance in recent years. The DelayLab goes well beyond simply layering sounds by providing features that open up new creative possibilities - such as reverse playback, triggered playback and using an expression pedal to control various parameters. There are also three types of delay that can be used simultaneously with the looper. Plus, the DelayLab is able to create performances overflowing with originality by adjusting the L/R delay times independently, or by attenuating the volume of the looped phrases each time you overdub so that the latest overdub will stand out. The 30 preset programs take full advantage of the DelayLab's extensive features and parameters. Editable and re-writable, these programs range from simple and versatile types, to complex and distinctive effects. There are also programs that reproduce the delay sound of famous guitarists as heard on classic recordings. All of the delay effects can be controlled simply using five knobs, ensuring that creating complex delay sounds is easy and intuitive. All parameters can also be assigned to an optional expression pedal for realtime control as you play, facilitating the creation of even more creative performances. The DelayLab boasts studio-quality specifications to guarantee flawless audio fidelity, including 24-bit/48 kHz processing. Innovative Seamless Bypass and Seamless Program Change features ensure a smooth transition in sound when you bypass the unit or switch between programs. Other convenient functions include a Sync Mode that makes it easy to set up complex polyrhythmic effects, and the Kill Dry feature, which completely mutes the direct sound. In every respect, the DelayLab is designed to satisfy the guitarist who insists on superior audio response to rival the finest equipment available. Information taken from official press release, for more visit Vox.